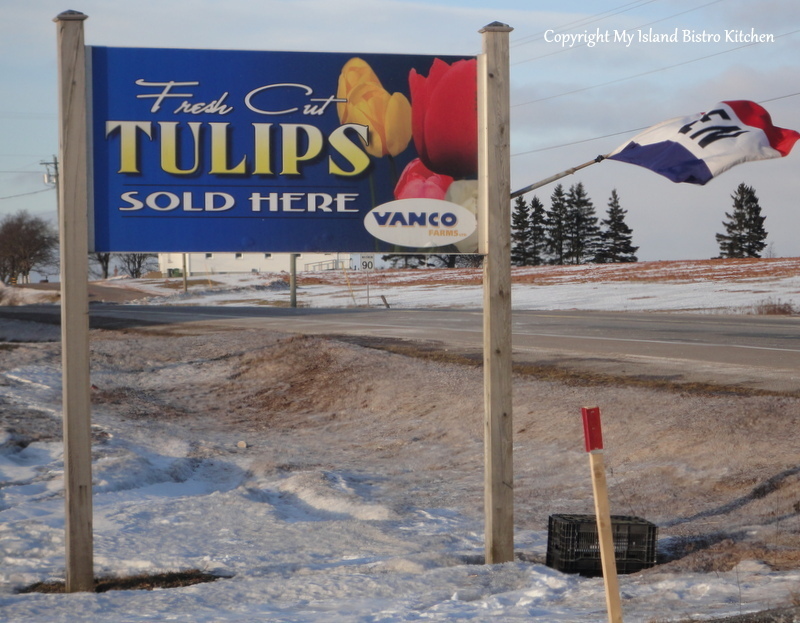 Update 2019: While Vanco Farms still grown wonderful tulips in their Mount Albion greenhouses, they no longer (as of January 2019) operate a retail outlet on the premises. Their fabulous tulips are available at several retain outlets around PEI, including major supermarkets and florist shops. It’s time again for me to share another tablesetting with you. 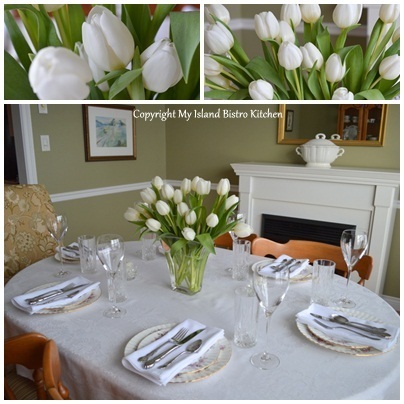 This time I was preparing for a casual dinner party for six and I was featuring Island-grown tulips in my centerpiece. I wanted to keep the tablesetting very simple and streamlined, unpretentious, and understated. But first, let’s go on a field trip to Vanco Farms to get the tulips and find out about their tulip-growing operation. Last week was the coldest week yet on Prince Edward Island this year. 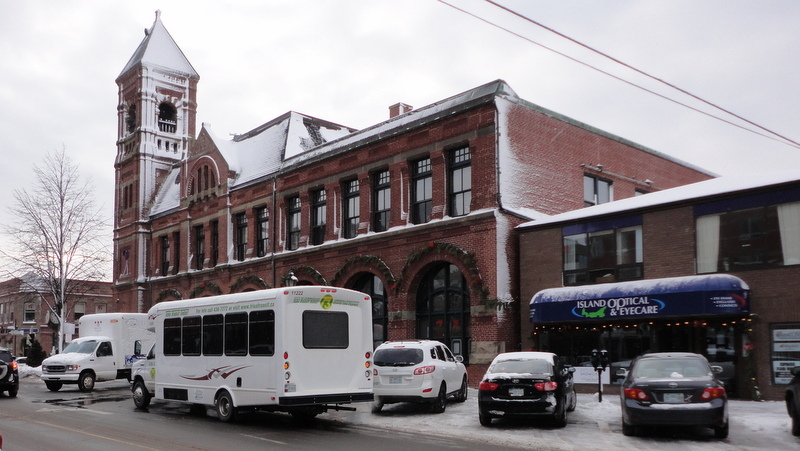 On Tuesday mid-afternoon, when I headed east out of Charlottetown, across the Hillsborough Bridge, I glanced at the computer screen on my dashboard and it was reading an outside temperature of a balmy -14C (without windchill factor which some days was down around the -30C to -34C range). As I drove along, I thought this was an interesting day to be heading to a tulip garden, a huge one at that. I have often stopped by Vanco Farms in Mount Albion, about a 15-minute drive outside of Charlottetown, to pick up some of their fabulous tulips at their onsite retail outlet. While sometimes I do purchase the tulips at a local supermarket, there is something about buying product right at source – the freshness is unbeatable. Last winter, I was rarely without their tulips throughout the house and, particularly, on my dining table. I had contacted Vanco Farms last spring about doing this story in connection with a tablescape but it was near the end of their season and they suggested I wait till January when their greenhouse operation would be in full swing. As is the case with several stories, particularly ones where growing food or flowers are involved, the story evolves over several months so I can capture the various steps in the process. So, let’s pick up the story way back on May 10, 2012, when, in preparation for this feature, I photographed a huge field of Vanco tulips in full bloom in Pownal, PEI. This was a field of tulips that were about to be cut down so that all the plants’ energy would be generated towards their bulbs that grow and multiply underground and not directed into the pretty blooms. How heartwrenching to see a tractor and cutter mowing down all these colourful petals; however, it is for long-term gain. The bulbs that are large enough will go for bulb sales or will make their way into the greenhouse to be grown for cut flowers over the winter. The smaller bulbs will be replanted in the fall and will be given the time to mature and grow into the more desirable large bulbs. Large bulbs will produce the larger, more premium blooms with stronger stems. So, fast-forward to January 22, 2013, when I visited the Vanco greenhouses and production facility. I was met by Bas Arendse who toured me through their tulip-growing operation. Seriously, on a cold January day, there is nothing more uplifting than to stroll through warm, bright greenhouses with thousands of tulips at various growth stages through to bloom. Vanco Farms began growing tulips in 2002 with a modest experimental crop of less than one acre. That venture has grown exponentially and, today, they grow some 3 million bulbs covering 40 acres – can you imagine and picture 40 acres covered in fabulous colorful tulip blooms! I asked Bas what made Vanco Farms decide to start growing tulips on PEI (they are the only commercial tulip grower on the Island). 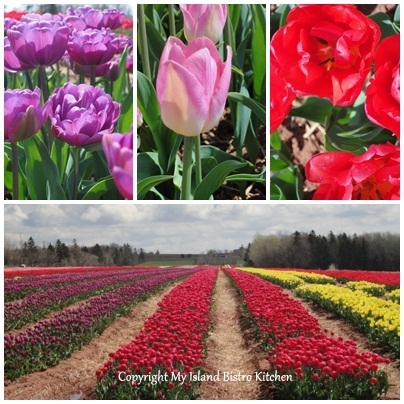 He tells me he grew up in Holland on a tulip farm that is still run by his father and sister and, when he moved to PEI, it was natural for him to grow tulips. Yes, I think it would be fair to say that tulip-growing runs through Bas’ veins and he has it down to a science. Thus, growing tulips is second nature for Bas. He says about 50% of their bulbs still come from Holland while the other 50% come from their own fields in PEI. So, basically, here is the process. The bulbs are planted in the fields in the fall so they have a chance to root before our harsh, cold winter arrives. In the spring, once the tulips come into full bloom, the petals are all cut off the plants. The bulbs stay in the ground for about 6 more weeks when they are then harvested. The bulbs are dried and separated with the smaller ones destined for field growth the following fall and the large ones set aside for greenhouse growing over the winter. The larger bulbs are planted in these trays in October-November and are kept in cold storage to recreate winter-like conditions for the bulbs – in other words, to trick the bulbs into acting as though it is winter. These are then moved into the greenhouse where the warmth will trick the bulbs into acting as though it is spring and time to grow. 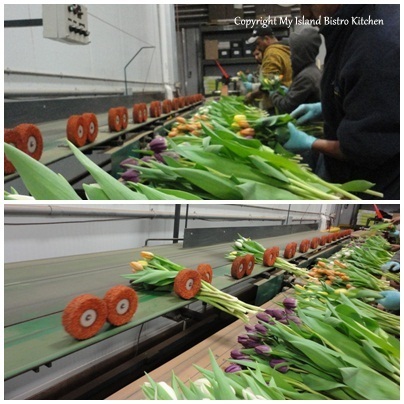 This process, known as tulip-forcing, means the tulips will be ready for market in about 21-28 days. Keeping a steady schedule of when these bulbs are taken out of cold storage at staggering times ensures there is always an abundance of tulips ready for market throughout the winter and early spring months. 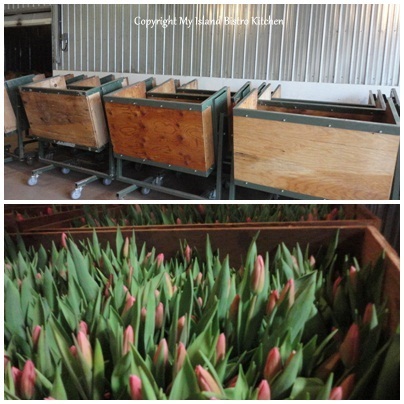 When the tulips are ready for cutting, they are picked and loaded into these carts. 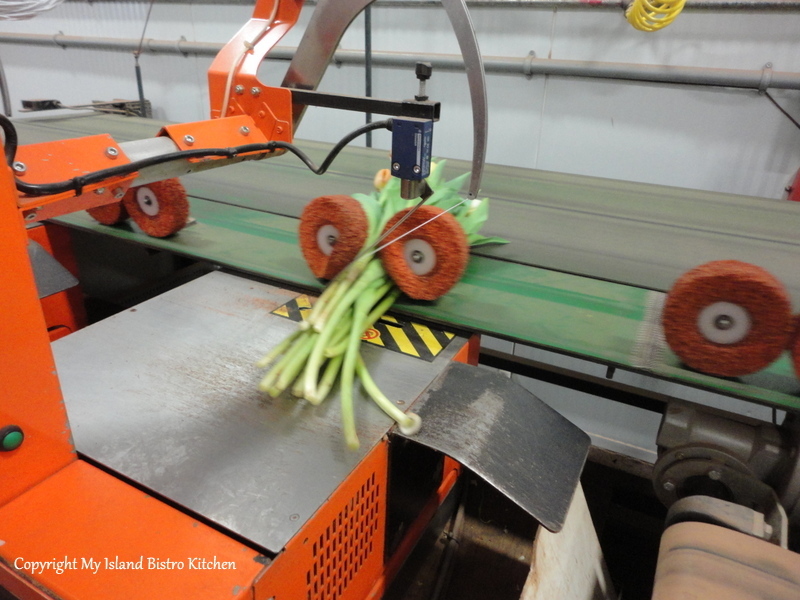 The tulips are then processed by this machine that cuts the bulbs from the stems. These bulbs will go into storage and be planted again next fall. 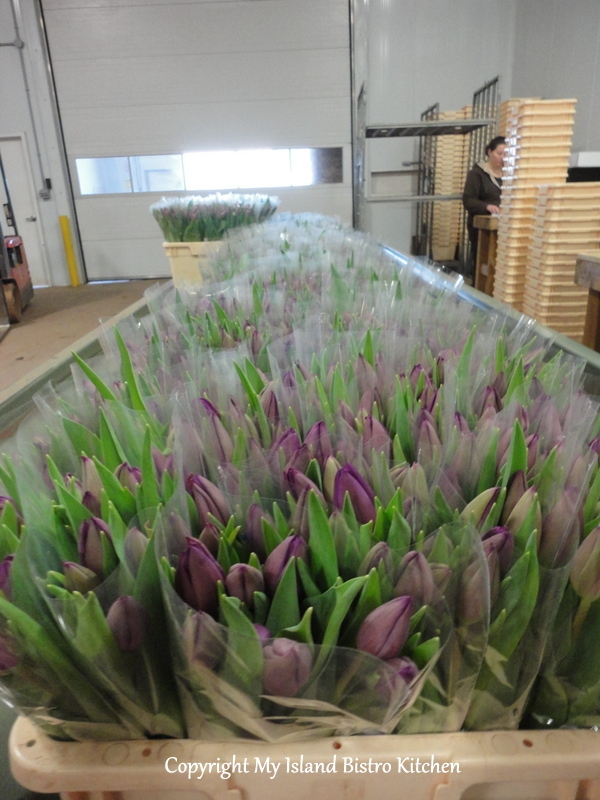 An assembly line of workers gather the tulips into bunches and place them on the conveyer belt. 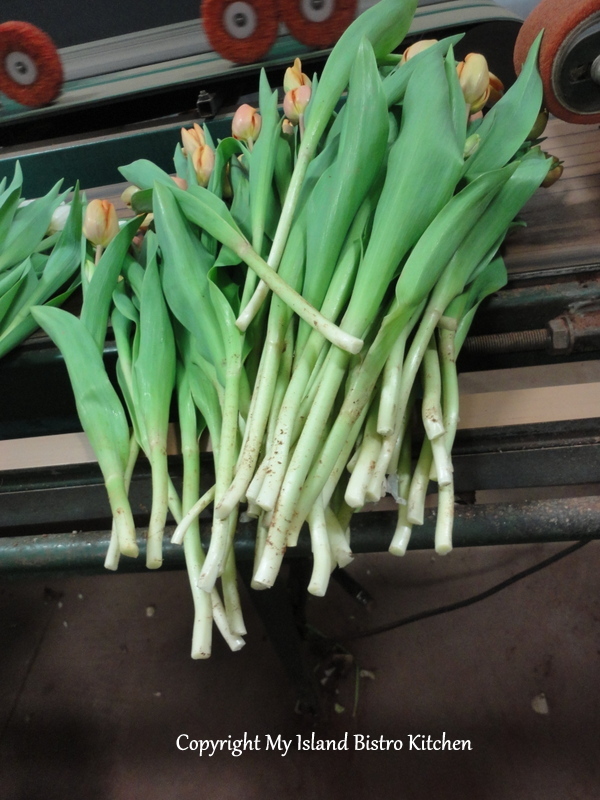 The conveyer belt takes the tulips through the machine that wraps elastic around them to hold them in place. 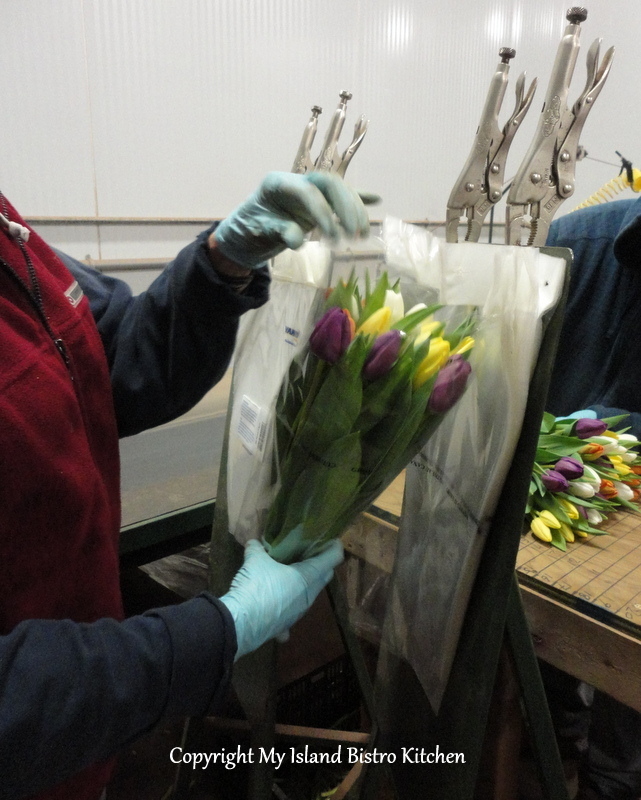 At the end of the conveyer belt, a worker takes each bundle of tulips and slips it into a plastic sleeve. The tulips are then placed in these crates which sit in water for about 30 minutes to allow the thirsty stems to soak up a drink. 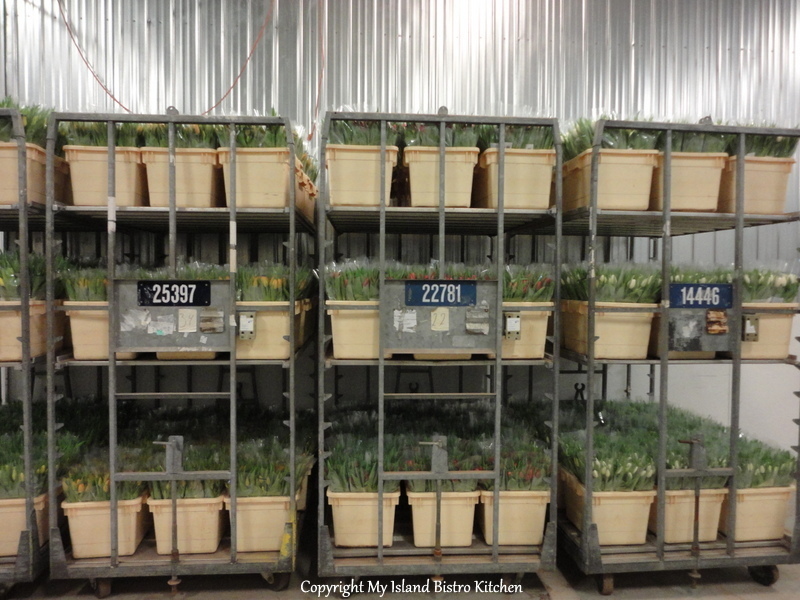 From there, the drained crates of tulips move into a cool storage room where the bundles of tulips are packed in boxes ready for shipping. While Vanco Farms does produce some tulip bulbs for sale, that accounts for only about 10% of their business with the remaining 90% coming from the sale of cut tulips that are grown in their greenhouses. In terms of best sellers, Bas says the most popular colors of tulips are yellow, orange, white, and pink followed by red and purple. I like them all! I asked Bas what the biggest challenge is to growing tulips in PEI. He says our typically cold spring weather can pose an issue, particularly if there is a heavy frost. This can cause the stems to go hollow and the bulbs to not grow. 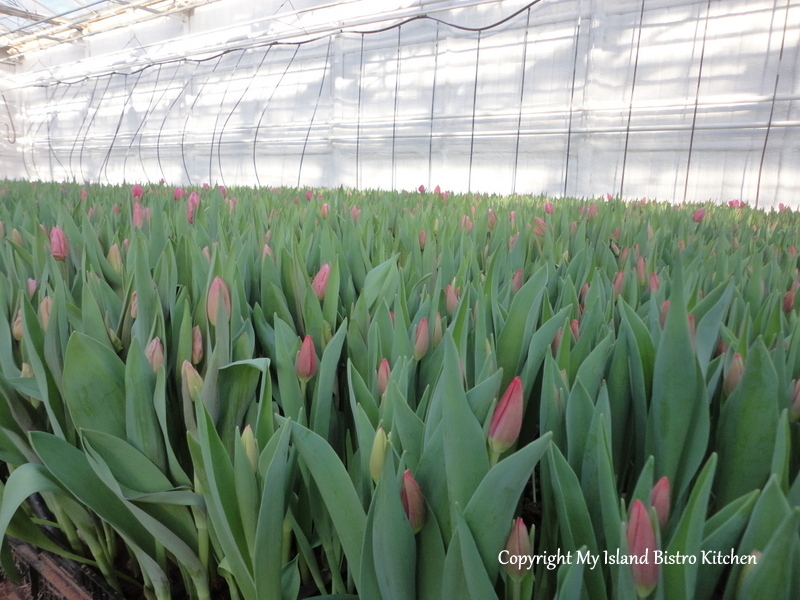 Tulip-farming at Vanco Farms is a year-round operation despite our relatively short growing season on the Island. January to May is their busiest time because it is when the greenhouse is in full production and so it is cutting season. During this time, they will employ between 15-25 people and have three delivery trucks on the road in eastern Canada and the New England area of the United States. The rest of the year is devoted to field work and processing tulip bulbs. 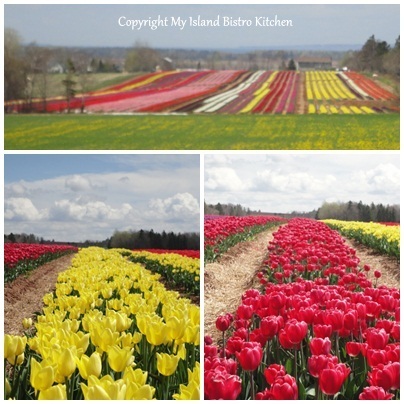 Vanco tulips are available at many places on the Island including the retail outlet at the farm in Mount Albion, major supermarkets, most flower shops, the Saturday Farmers Market in Charlottetown, and Riverview Country Market in the east end of the City. 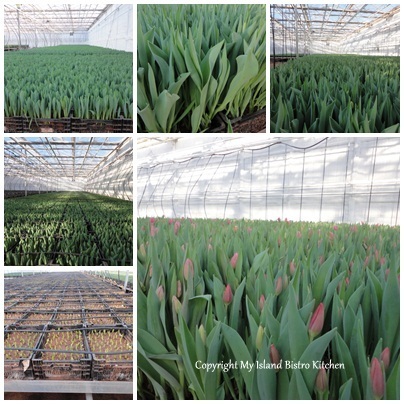 They also export a large portion of their greenhouse-grown tulips from January to May. In fact, their delivery trucks transport shipments of fresh tulips to Nova Scotia, New Brunswick, and Quebec twice a week and to Boston once a week. It’s always a highlight of my winter when I discover Vanco tulips are on the market! Their colourful blooms always inject a bit of bright color into those dark, dreary winter days. I like tulips for dining table floral arrangements. Not only do they have beautiful simplistic blooms on long elegant stems with wonderful greenery but they are also not heavily scented which means they don’t compete with food scents. 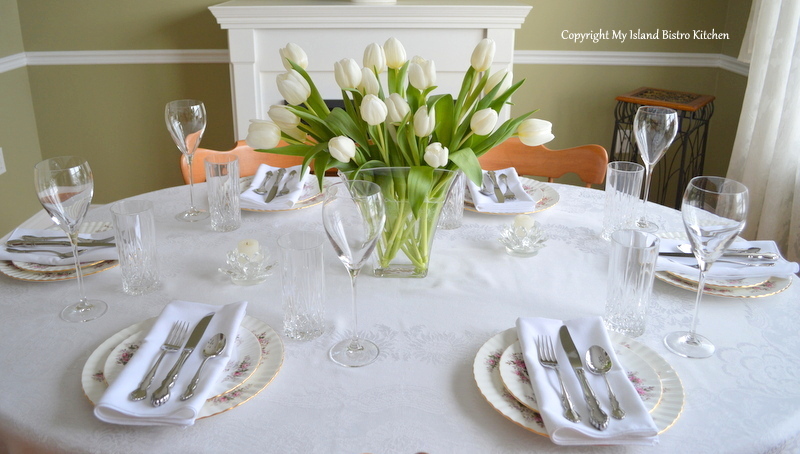 There are any number of ways to arrange tulips for the dining table. 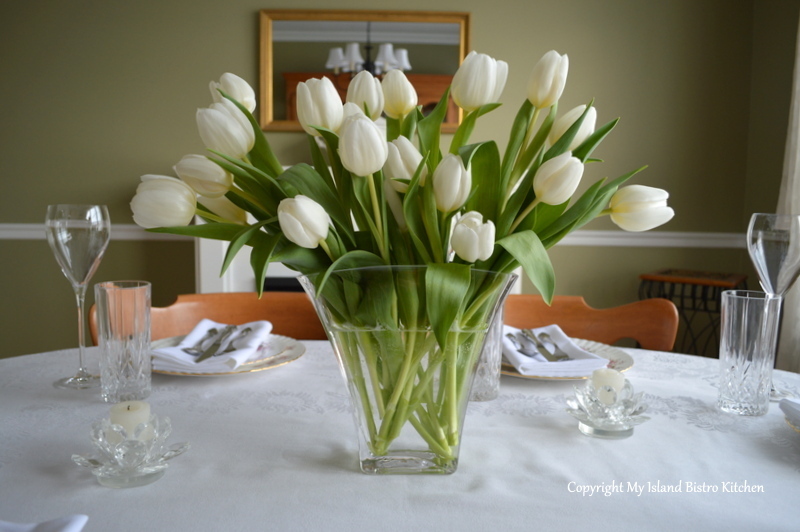 Here I have selected Vanco’s Snow Lady white tulips and I simply arranged 20 of them in a fluted vase for this casually-elegant tablesetting because I was looking for something very simplistic and not fussy. I chose white because it blends in with winter and also because it matches anything. 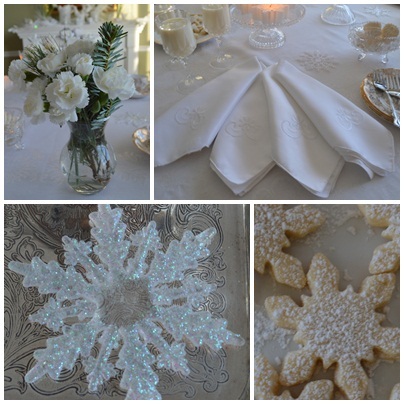 In this particular setting, I used a white tablecloth and napkins and my china pattern which is largely white. I like how the white blooms just seem to pop from the greenery! The wine glasses I chose to use are very simplistic and are actually somewhat tulip-shaped themselves. I opted to go with a plain, flat napkin fold because I didn’t want anything to detract from the tulips – I wanted them to be the focal point of the table. 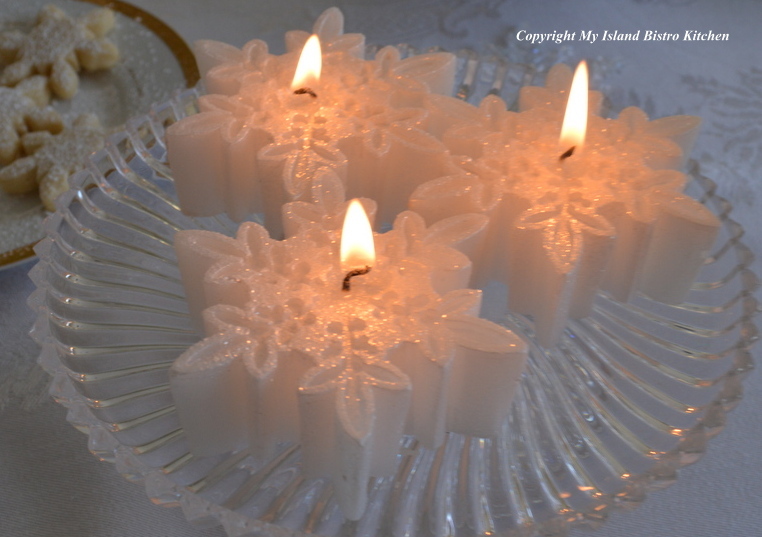 I also chose just a couple of small crystal votives, again so there would be nothing to compete with the floral centerpiece. Florist Bernadette Praught of Bernadette’s Flowers in Stratford, PEI, has high praise for Vanco tulips. She says being able to go directly to their greenhouses about 10 minutes from her flower shop and pick up freshly-cut tulips means she is getting the freshest flowers possible for her customers. Bernadette says tulips are thirsty flowers and do best if arranged directly in water as opposed to in oasis arrangements. Tulips can be used in combination with other flowers and made into more elaborate arrangements. Bernadette says tulips pair well with roses and with a variety of greenery and Baby’s Breath. So, tulips are a very versatile flower. You can go with something very simple as I have done here or you can really dress them up. 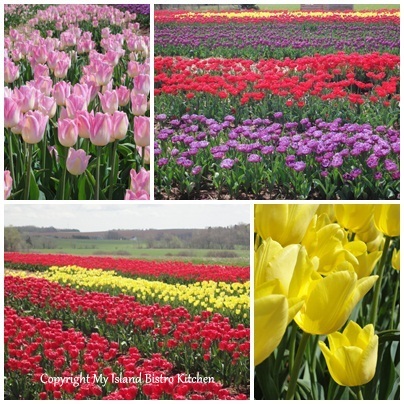 For more information on Vanco tulips, visit their website. Vanco Farms Ltd. is located at 9311 TransCanada Highway, Route 1 in Mount Albion, PEI. 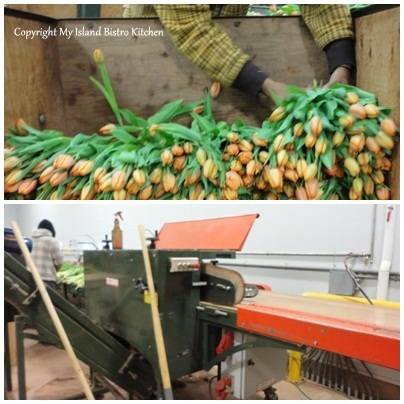 The next time you are buying a bouquet of tulips, be sure to look at the sleeve label….you just never know, they might be ones that were quality-grown right here on Prince Edward Island! Today, I begin my new 2013 monthly series on my food blog. 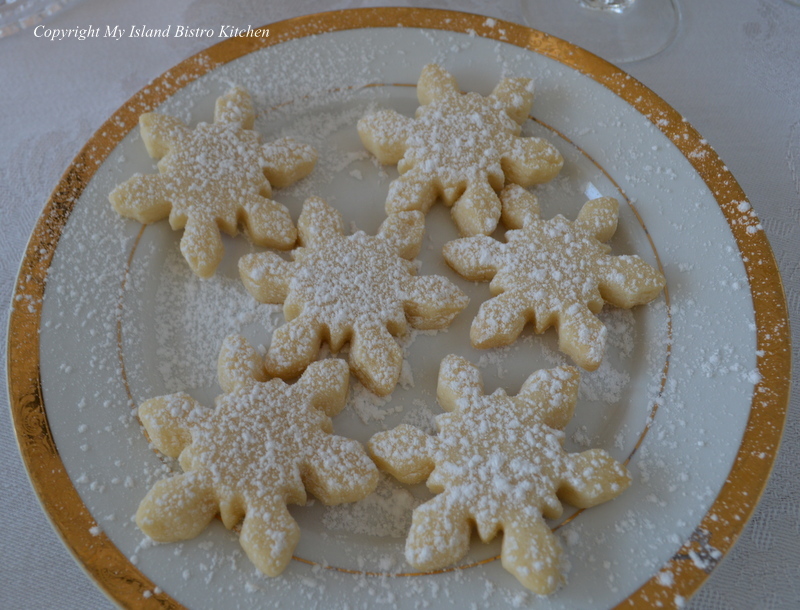 Once a month, I will be posting a recipe and photographs of a favourite cookie. 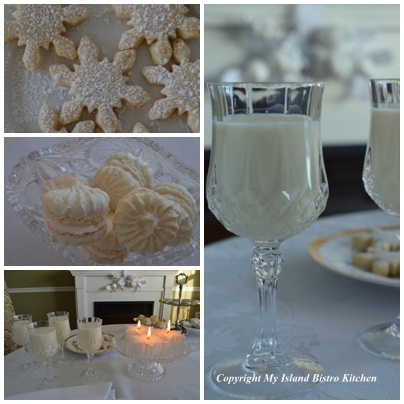 To start, I will share my recipe for shortbread. There are so many recipes and versions of shortbread. This perfectly plain, delicate cookie attributes its origin to Scotland so it is fitting that I should choose this cookie for my inaugural “Cookie of the Month” series given that today is Robert Burns Day. Robbie Burns is often referred to as Scotland’s national poet and many of Scottish ancestry, including those on PEI, celebrate his birthday on January 25th. It’s a time to bring out the tartan apparel and, at least on PEI, there are Scottish concerts and dinners in honour of the poet. Sometimes called Scotch cookies, these sweets have always been a Christmas tradition in my family. Cut into petite squares or decorative dainty shapes and finished with a small dob of icing and a smidgeon of a red cherry or a silver dragée, Scotch cookies have been found on many a sweet tray over the holidays for years. I think they may have traditionally been associated with Christmas because they were considered a luxury treat with their butter and sugar content. Today, I make them various times throughout the year in different shapes and sizes. In fact, they are almost always a staple on hand in my freezer. Shortbread is relatively easy to make and does not take a lot of ingredients or ones not likely to be found in most kitchens. Recipe ingredients do vary, however. You will find that, in addition to some kind of fat, sugar, and flour, some shortbread recipes call for the addition of cornstarch, confectioner’s or brown sugar, salt, egg yolk, and/or vanilla. Other recipes call for a 50/50 mix of butter and shortening. I have even seen some recipes list cream of tartar and/or baking soda as ingredients. 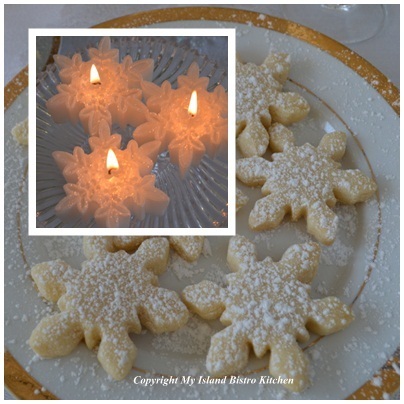 Shortbread purists, however, are likely to argue that, technically, there are only supposed to be three ingredients in traditional shortbread – 1 part sugar, 2 parts butter, and 3 parts flour and no leavening agent or other flavourings. My recipe does follow the 1-2-3 parts rule for sugar, butter, and flour. For example, start with ½ cup of sugar, double it to determine how much butter is needed (1 cup) and double the amount of butter to arrive at how much flour is required (2 cups) and you essentially have a recipe for shortbread. Everything about quality shortbread focuses on high quality ingredients so that you get that melt-in-your-mouth sensation with just one bite into a shortbread cookie. I use pure creamery butter and, today, my featured Island product is Wiltshire butter produced in North Wiltshire, PEI. For shortbread, I find it is important that the butter be at room temperature so it will cream easily. Do not soften the butter in the microwave as it breaks it down too quickly and it becomes liquefied which may alter the texture of the dough. My recipe calls for brown sugar so the cookies made from this recipe will be a little darker in color than if white sugar or confectioner’s sugar is used. I do add an egg yolk because I find it helps to bind the ingredients together and gives the shortbread a nice texture. I also add a pinch of salt and sometimes – but not always — some vanilla. 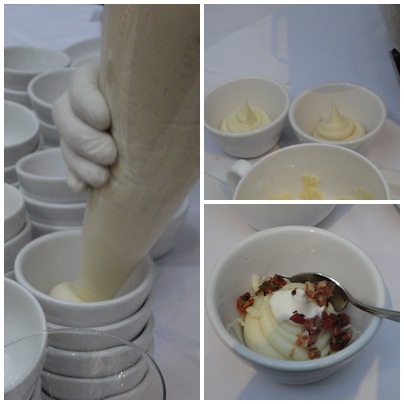 If using vanilla, make sure it is pure and not artificially flavoured. What determines the quality of a good shortbread is how “short” it is. When you bite into a shortbread, the cookie should crumble easily and you should be able to taste the butter flavour as the cookie slowly melts in your mouth. You won’t get that if you use a mixture of butter and shortening or all margarine, for example. I like the dough in this recipe – it holds together well, does not take a lot of kneading to incorporate all the ingredients and prepare it for rolling, rolls out without cracking or breaking apart, and almost has a satin-like feel to it. Shortbread dough should only be minimally kneaded – just enough for it to stick together and allow it to be rolled out for cutting. Some recipes indicate the dough should be chilled before rolling and the cookies, once cut into their shapes, should be put in the refrigerator for 10-15 minutes to set before baking so that they won’t spread out of shape during the baking process. With the dough in my recipe, I don’t find chilling either the dough or the unbaked cookies is necessary because, with no leavening agent, they will not spread out of shape. That factor makes shortbread the ideal choice when maintaining a consistent and uniform shape of cookies is important. If, however, for some reason you find the dough is too soft to work with then, by all means, chill it for several minutes as this will not harm the product. I don’t like super-thick shortbread so I roll the dough to a scant ¼” thickness. Of course, I always use parchment paper for cookie baking and the cookies should be baked in a slow (300F) oven so they don’t burn. With the high butter content, baking them in a hot oven will run the risk of them burning or turning too dark in color. Today, I have divided the dough, making part of the recipe into shortbread fingers using a traditional rectangular-shaped shortbread cookie cutter 1” wide by 3” long. For the remainder of the dough, I rolled it into about a 7” circle and, using the tip of a sharp knife, scored the dough into 8 wedges. Don’t cut all the way through; just score it lightly on the cookie top. You can use the tines of a fork to press lightly the outside edge of the circle and also to prick the surface of the dough into a decorative pattern. Once the shortbread is removed from the oven, immediately cut all the way through the score marks and separate the wedges which are often called “petticoat tails”. In bowl of stand mixer, beat the butter on high speed until light and fluffy (2-3 minutes). Add the sugar and beat until smooth, scraping the bowl as necessary. Add the egg yolk and vanilla. Beat until incorporated. With mixer on slow speed, stir in the flour and salt just until mixed. Turn dough onto lightly-floured surface. Gently knead dough just until it holds together. Do not over-knead. Shape dough into a round mound. Roll to approximately ¼” thickness. Cut into desired shapes. If desired, dough may be rolled into small 6” or 7” circles and scored with the tip of a sharp knife into wedges. When cookies are removed from the oven, immediately cut through scored lines to separate the wedges. These cookies will keep for about a week in an airtight container at room temperature. They also freeze well. I am still experimenting with black garlic in recipes. If you have been following my postings, you will recall my January 12, 2013, entry using black garlic in a sauce over sea scallops. My latest culinary escapade finds it is a suitable flavouring for sauces for meat as well. Below you will find the recipe I created for a pomegranate, red wine, and black garlic sauce to accompany a marinated pork loin roast. It serves 2-3. As I described in my January 12th posting on black garlic, don’t expect any traditional garlic flavour from this fermented version which is very sweet and tastes more like a fig or a prune than it does garlic. I like pomegranate molasses but it can sometimes be hard to find as many of the traditional supermarkets in my area don’t tend to carry it. However, if you can locate a grocer who sells Middle Eastern food in your area, you are most likely able to find the molasses there. The marinade itself is very traditional but the sauce I have created for drizzling over the roast pork loin slices is a somewhat sweet sauce with a rich burgundy color which, of course, comes from the combination of the pomegranate molasses, red wine, and black garlic. It makes a fine pairing, both in taste and visually, with the roast pork. Mix all ingredients and place in dish. Place roast in marinade and turn once to coat. Cover and place in refrigerator for 3-4 hours, turning occasionally to baste. Preheat oven to 425F. Place roast on rack in small roaster. Roast, uncovered, for 15 minutes. Reduce temperature to 325F and continue to roast, covered, until internal temperature of roast registers 150-160F on meat thermometer. Remove from oven and let stand, covered for 10-15 minutes before slicing and serving with Pomegranate, Red Wine, and Black Garlic Sauce (recipe below). Melt butter in saucepan. Add shallots and sauté for 2-3 minutes. Add black garlic. Stir and sauté for apx. 30 seconds. Add pomegranate molasses, chicken stock, balsamic vinegar, red wine, brown sugar, and cardamon. Stir over medium heat just until mixture reaches boiling point. Reduce heat to low. Mix cornstarch into orange juice. Add some of the hot mixture to the orange juice and cornstarch mixture to temper it. Add the mixture to the pot. Stir over medium-low heat until thickened. Slice roast into 1/4″ thick slices and plate. Drizzle warm sauce over pork. I served the pork loin roast with potato croquettes and roasted root vegetables which were lightly tossed with a maple syrup and balsamic vinegar dressing. My Island Bistro Kitchen Celebrates First Anniversary of Food Blogging! One year ago today my blog went live! It’s been a great year of cooking, baking, and traveling across the Island to meet local producers and write feature stories about the great food products they grow, fish, or produce. I have thoroughly enjoyed taking their products and creating recipes that feature them. It’s amazing the variety of foods and beverages that are grown or produced on Prince Edward Island or fished in the waters that surround our Island! Thank you to all those who accommodated me with my requests for interviews over the past year and who granted me behind-the-scenes access so I could take photographs and bring you stories of the foods and food festivals and events on PEI. And, thank you to all who have visited my blog and read the stories over the past year. I hope you have enjoyed them. I have a great line-up of upcoming feature stories and recipes for my blog. 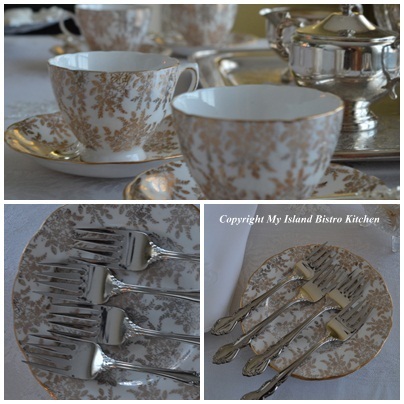 From time to time, I will mix in some tablescapes and table settings along with some afternoon teas for variety. So, from land and sea to table, there should be something of interest for everyone! In a few days time I will be launching a new monthly feature on my blog and you won’t want to miss the yummy recipes that go with it. To ensure you get notified each time I post a new entry to my blog, be sure to sign up for email notifications. You can find the sign-up feature in the upper left-hand corner of my main page. 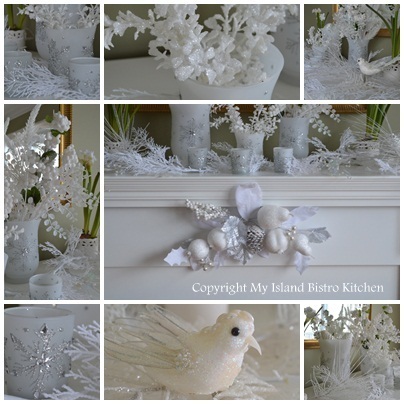 And, don’t forget to follow me on twitter @PEIBistro and on Pinterest at “Island Bistro Kitchen”! Black Garlic – Garlic’s New Cavier? Ever heard of black garlic? What do you think of when you hear the term? Black garlic is not a variety of garlic grown. Rather, it is regular garlic bulbs that have gone through a fermentation process. Fermenting garlic to turn it into black garlic is truly food transformation. I say that because black garlic in no way tastes, looks like, or has the same consistency as the traditional hard white garlic we use to give garlic flavour to dishes. To find out more about black garlic, I travelled to Kensington, PEI, where I paid a visit to garlic grower, Al Picketts, of Eureka Garlic. Al has been growing garlic for 12 years. In 2012, he grew 42,000 plants and this year, with the cloves already in the ground since October, Al has increased his crop to 46,380 plants which will be harvested in July-August, 2013. He grows eight types of garlic and 78 varieties in those types. Yes, Al knows a thing or two about garlic! Al’s main business is in selling seed garlic but, in November, 2011, he began the fermentation process to turn garlic into black garlic. Al has been working with the Bio Food Tech Center in Charlottetown as he perfects his fermentation process and product. While Al keeps his exact fermentation process a carefully-guarded secret, he did show me a recycled refrigerator that he insulates well, heats with a water heater, and uses as an incubator of sorts for the fermentation process. Inside this incubator are stacks of covered plastic storage boxes containing hundreds of garlic bulbs fermenting. He tells me it takes about three weeks in controlled temperature for the fermentation to occur. The top right photo below shows a garlic bulb in the early stages of fermentation and the one in the lower right photo is a completely fermented bulb. 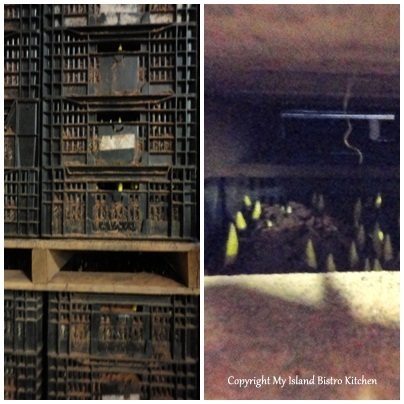 The photo on the left below shows different colored bulbs in the plastic containers; these are bulbs at different stages of the fermentation process as they change and deepen in color. When fermented, the cloves will be a dark chocolate brown color – almost black — and very soft. This is not the kind of garlic you could put through a garlic press and it does not mince well. But, oh, it does have its own unique flavour! The cloves can be carefully sliced or mashed with a fork and added to recipes. When Al offered me a taste of the black garlic, straight up, I must admit I was trying to prepare my tastebuds for a somewhat pungent, strong garlic flavour. But, one of the most surprising things about black garlic is the taste. I would describe it as somewhat sweet, no discernible garlic taste, and being a cross between a prune and a fig in taste, color, and texture. So, if you are looking to use it as you would regular garlic, don’t expect any garlic flavour in the dish as black garlic has a sweet, fruity taste. Black garlic, however, brings its own unique subtle flavour to dishes like soups, sauces, and seafood and is often used in Asian cooking. The black color does not change when cooked so you need to prepare for that color in your dish. There are not a lot of black foods and some might suggest they would not be appetizing. However, I find the contrast of the black garlic on white fish, for example, to be quite dynamic and appealing. Black garlic is a relatively new local food item and the jury is still out as to whether it is a food fad or if it may well become a food trend. Could it be garlic’s new cavier? Promoters claim it may be the next superfood, citing its health benefits — it reportedly boasts twice as many antioxidants as raw garlic. That said, I couldn’t find any scientific research studies completed on black garlic that would state conclusively what its specific health benefits are. So, if it doesn’t taste like garlic why, then, use it? I would say because it offers another flavouring and complexity to many dishes. I have used it on pizza and in seafood dishes and I plan to try it next with pork. Al tells me that black garlic can be stored at room temperature – no refrigeration required – for several months. He says it can also be stored in the freezer and, when you want to use it, just remove as many cloves as needed and mash them with a fork or slice them with a knife – there is no need to thaw them first. Al sells his black garlic for $30/pound. On Prince Edward Island, it is available directly from Al at his farm “Eureka Garlic” on the corner of Routes 2 and 233 in Kensington (902)836-5180. As you know, when I visit a local producer, I bring home their product and make a recipe featuring the food item. The recipe below, for scallops, is how I used black garlic with seafood and I found the result really tasty (yes, I’ve made this dish more than once already!). The black garlic does not mask the scallop flavour and yet it accents the seafood well. This recipe serves two. Melt 2 T butter in small skillet. Over medium-high heat, sear the scallops 2-3 minutes per side until lightly golden in color. Transfer scallops to plate and keep warmed. Add 1 additional tablespoon of butter to skillet. Add the black garlic and sauté for 30-45 seconds. Add pepper to taste. Add white wine, balsamic vinegar, and lemon juice. Stir over medium-low heat 1-2 minutes until sauce reduces. Add herbs and heat for about 30 seconds. To serve, plate the warm scallops and spoon the black garlic sauce over the seafood. Serve with potato or rice and a side of vegetables. 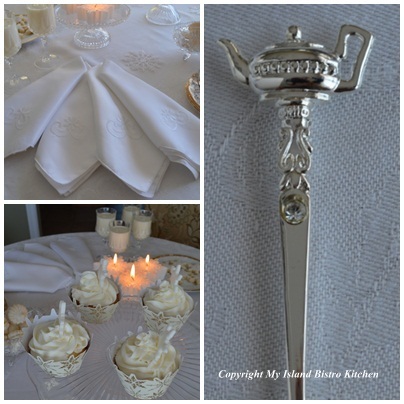 For the past few weeks, I have been sharing some of my tablescapes as well as table and afternoon tea settings. 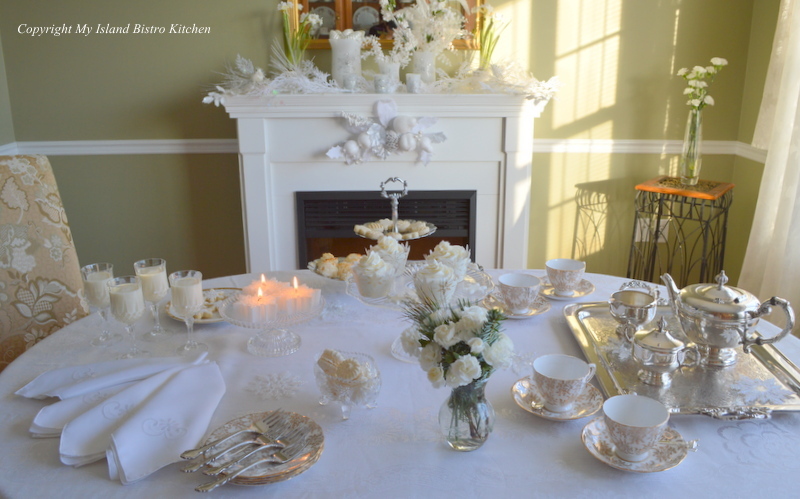 I will share one more afternoon tea setting before I return to my usual food stories and recipes. What better way to spend a snowy afternoon than having tea with friends. Living in northeastern Canada, snow is common so I drew my inspiration for this tea from the snowflakes that were gently fluttering and falling outside my window just before the sun came out on this late afternoon. For this tea, I have opted to host it buffet style and all in a winter white theme accented with gold. 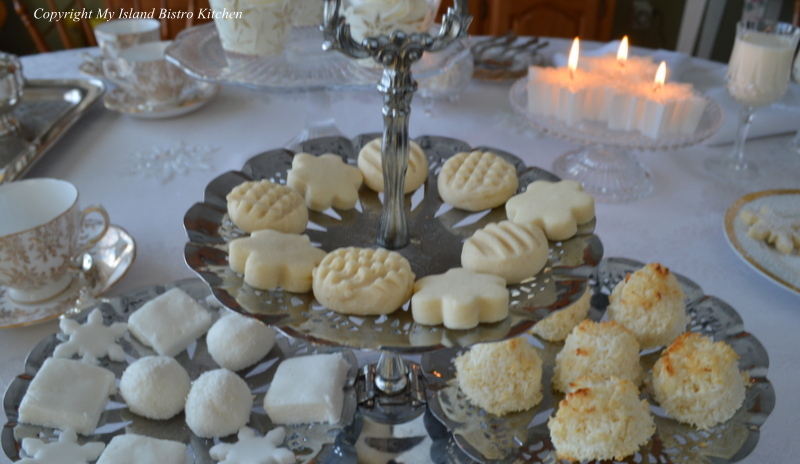 Lots of shortbread accompanied by coconut macaroons and divinity fudge, some made into wee snowballs. 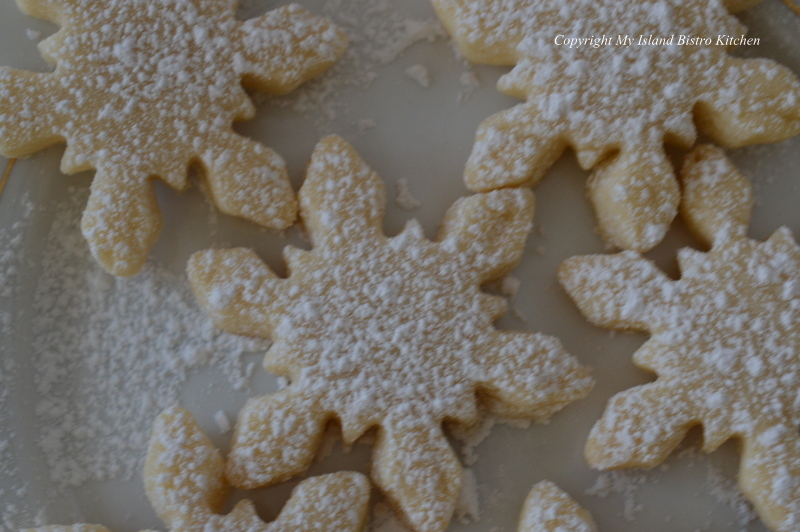 A light dusting of confectioner’s sugar gives the illusion of snow on these sugar cookie snowflakes! 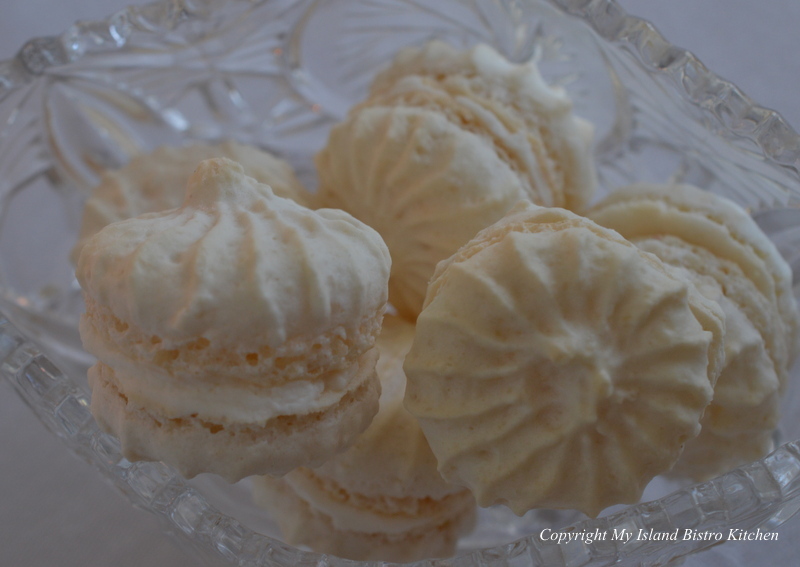 Dainty French macaroons sandwiched together with buttercream icing are light and airy. They make a fine addition to any tea table. 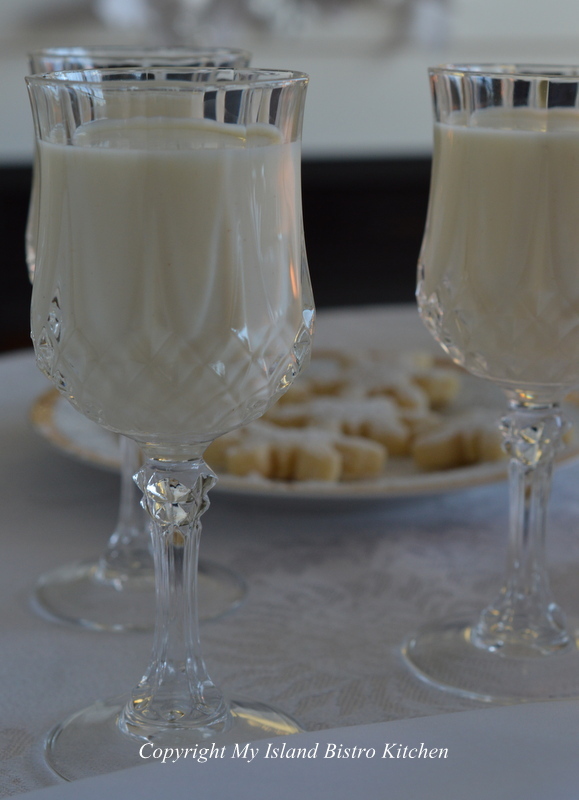 Eggnog, always a seasonal beverage, goes well with vanilla cupcakes which are decorated with edible snowflakes. 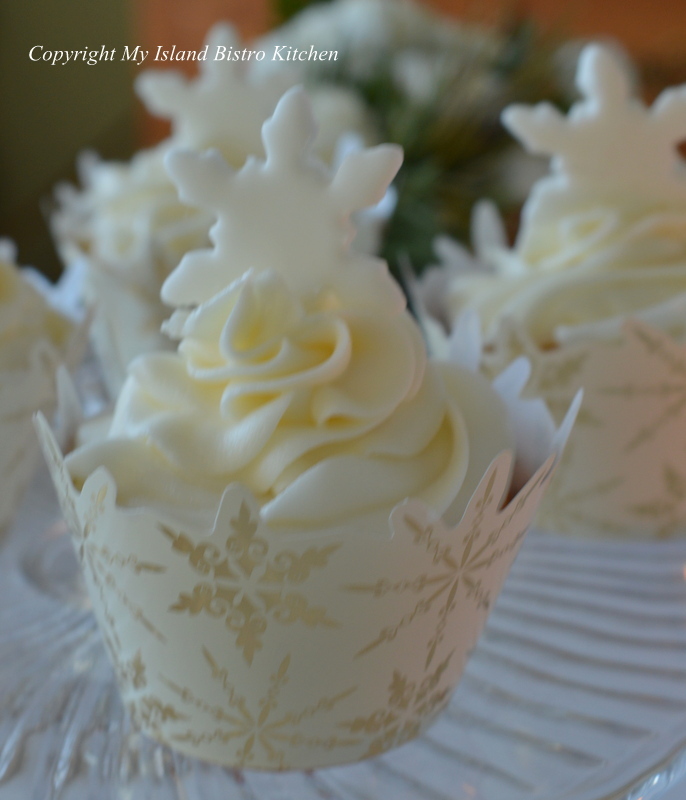 These cupcakes, frosted with almond buttercream icing and presented in their white and gold snowflake wrappers, were the stars of the afternoon tea! 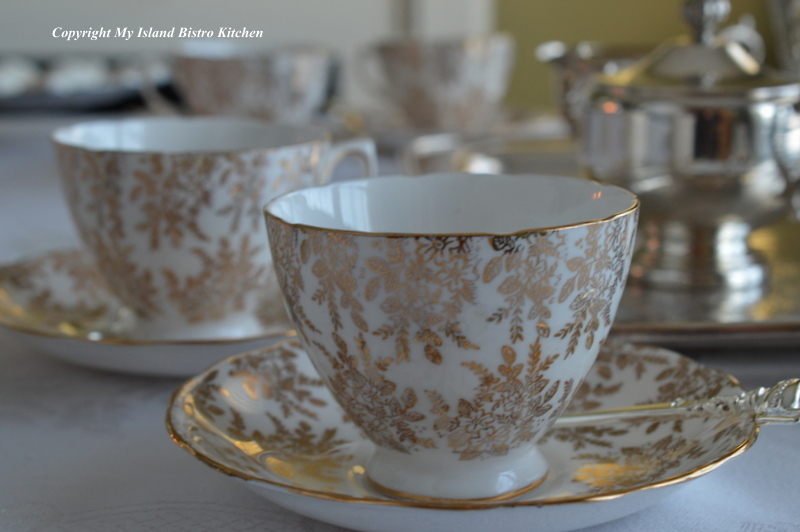 I love these elegant and delicate gold and white teacups. 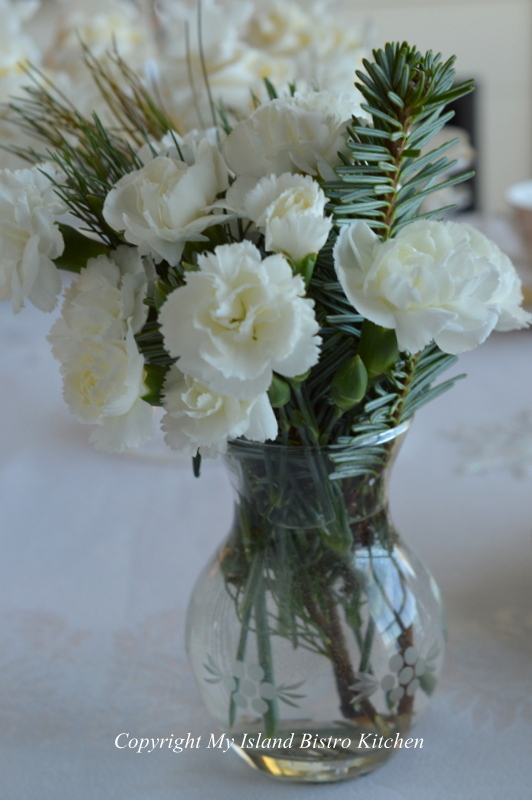 Mini white carnations blend well with the winter white setting. I found these candles at our local Winners store and I knew immediately what they would be used for! They added glow and ambiance to a late afternoon tea. Happy New Year, everyone! 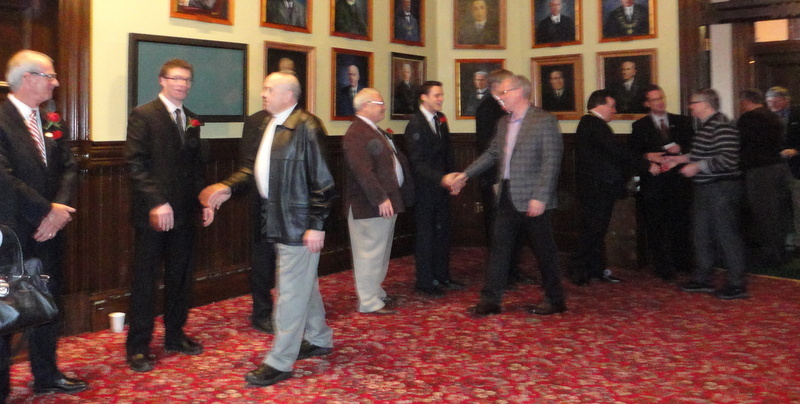 Today, I followed a New Year’s Day tradition in Prince Edward Island — attending several levées in Charlottetown. There were many of these events across the Island today. 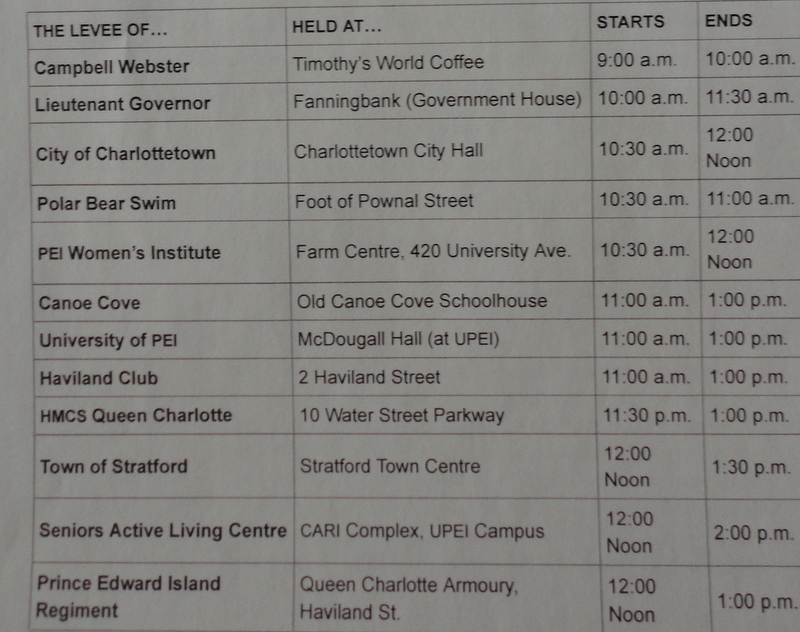 The list below is just a partial list of those in the Charlottetown-Cornwall-Stratford, PEI areas. One man told me that he had attended as many as 23 levées on one New Year’s Day! We certainly didn’t partake in that many but we did attend six. Levées have their origins in France. The first recorded Levée held in Canada was in 1646. Originally, these were events reserved for men but, for decades now, women also attend. 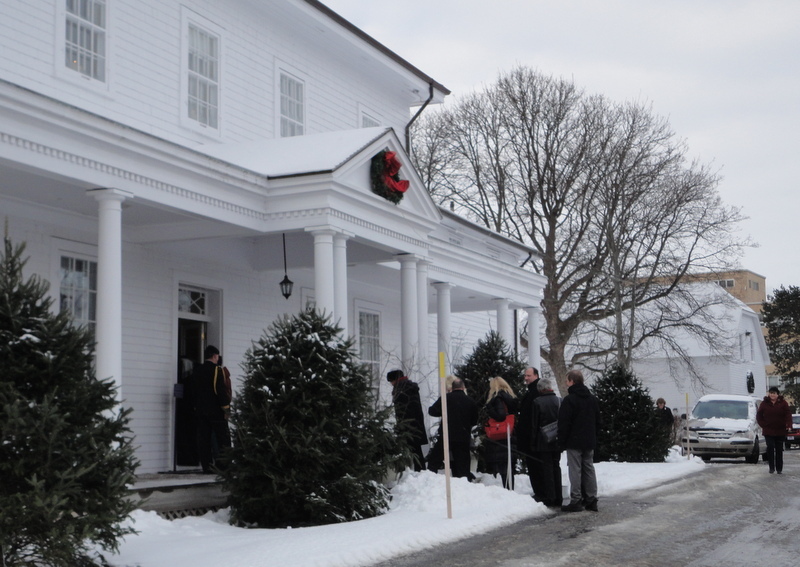 The purpose of levées is to give the opportunity for citizens to pay their respects and offer well wishes for the new year to representatives of the Monarch, provincial and municipal leaders, the military and, really, any other group or organization that chooses to host a Levée. In Charlottetown today, for example, the President of the University of Prince Edward Island was hosting a levée as was the Bishop, the Women’s Institute, and some business owners. Levées are very social events and are traditionally a way for those in public office to connect with the citizens they serve and for people to mix and mingle while renewing old acquaintances as they gather. Typically a levée lasts 1-2 hours. Calling cards or business cards are appreciated as each levée-goer is presented to the dignitaries. However, if you don’t have your own cards, blank ones are available at each venue. It is not uncommon for groups of people to sport around in mini-vans with designated drivers or hire a bus or mini-bus to transport them between the levée venues. This is a particularly good idea for those intending to “imbibe”. It also helps with parking as levées on the Island are a popular way to spend New Year’s Day and, generally, draw crowds of several hundred. Some people actually strategize and plan out the best way for them to attend as many levées as possible. Some have it down to a science! A big part of levées are the refreshments. 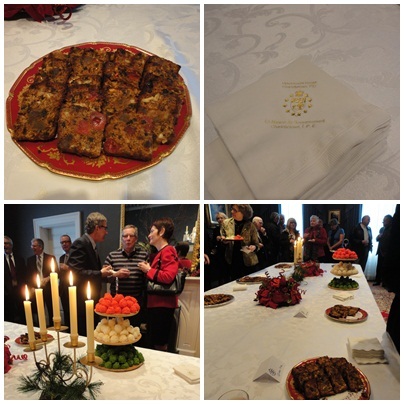 In PEI, we can certainly boast of our hospitality and refreshments at events like levées! The fare and beverage offerings vary from venue to venue but, suffice it to say that you wouldn’t have to visit too many levées before your tummy would be full. I’ll talk more about the refreshment aspect as I describe the six levées I attended today. 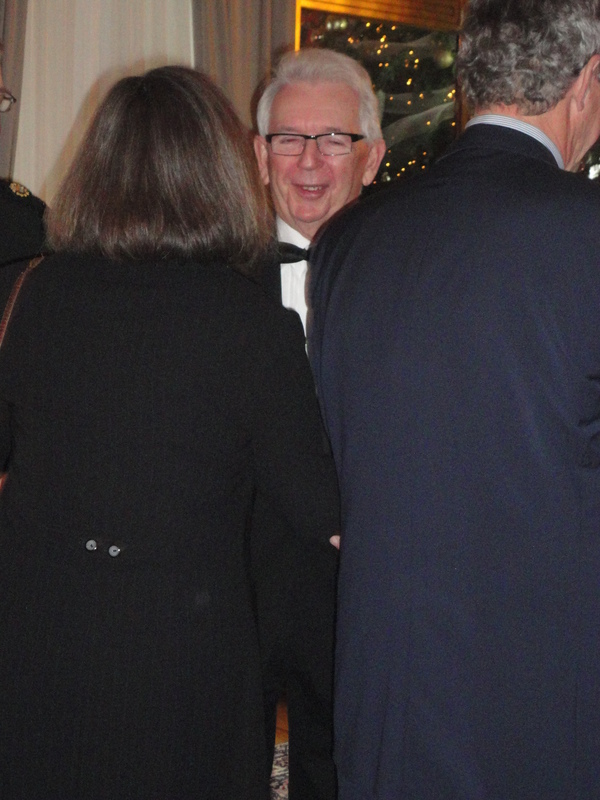 As you can imagine, as a foodie, I was particularly interested in the fare served! 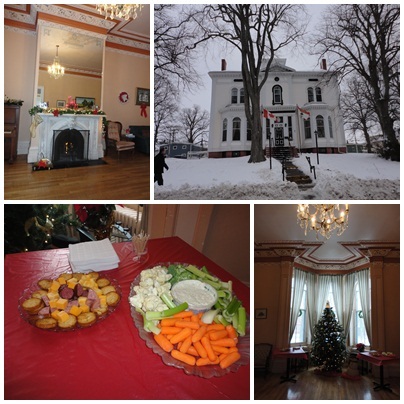 Our day started out at 10:00am by visiting Fanningbank, home of the Island’s Lieutenant-Governor, Frank Lewis. Last year, it was drizzling rain and we had a long wait outside but, this year, we were there at the start of the levée and had no wait to speak of. Good thing as it was about -7C this morning. The architecture of this fine Georgian-style home is well worth a visit. 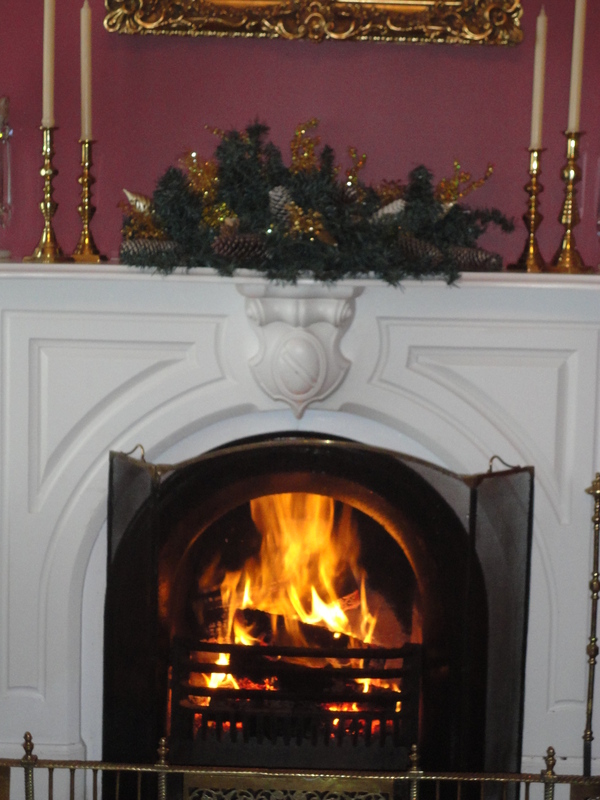 The Christmas decorations were still in place and the wood fireplaces were crackling and sending good warmth throughout the home. 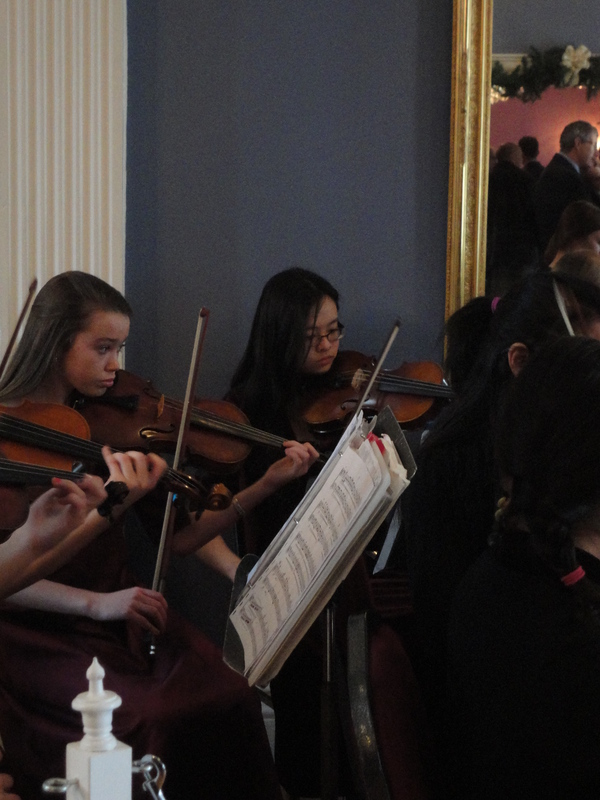 The Singing Strings, a youth string orchestra, entertained and provided wonderful background music as visitors wound their way around the grand foyer to greet the Lieutenant-Governor and his wife. 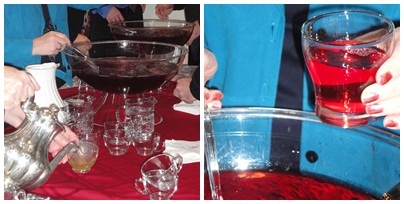 After bestowing good wishes for the forthcoming year to Her Majesty’s representative on the Island, attendees were offered the choice of either hot apple cider or a cranberry and vodka cocktail. The dining room table displayed several plates of fruit cake (which was very moist and tasty, by the way) and, what I considered to be the star of the food table, wonderful coconut macaroons, nice, soft, and chewy – just the way macaroons are supposed to be! 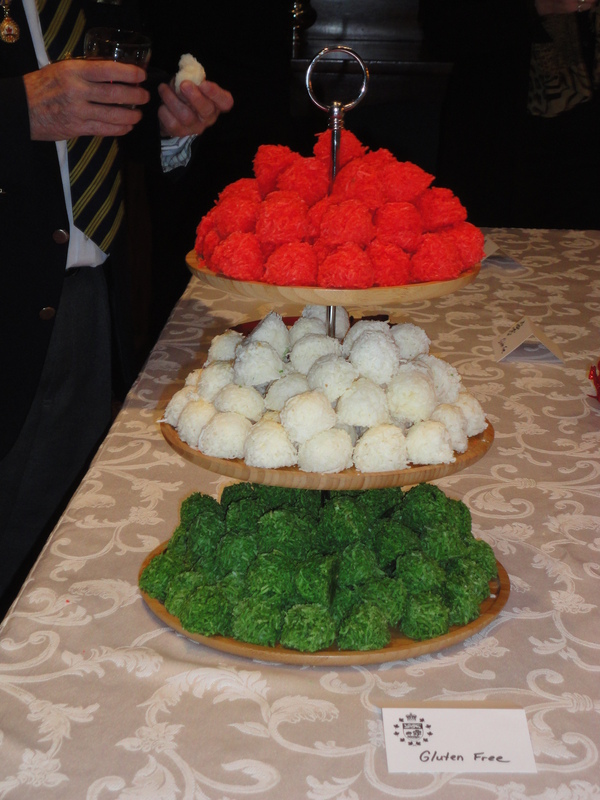 Aren’t these coconut macaroons resplendent in their holiday colors! From Fanningbank, we made our way up Kent Street to City Hall where Mayor Clifford Lee and the city councillors were receiving Levée-goers. Our City’s leaders looked fine, each sporting a red rose on his lapel. Treats at City Hall included crackers and cheese along with cookies including gingerbread men. Beverages consisted of a choice of white wine, fruit punch, tea, or Starbuck’s coffee. 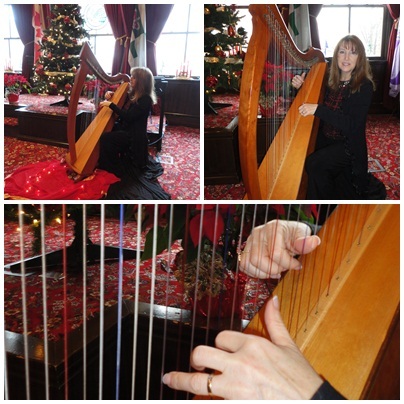 PEI harpist, Jill Harris, provided wonderful background music for the event. Leaving City Hall, we travelled down to Haviland Street to the Haviland Club. I had never been in this historic building before and found its interior design quite intriguing. Refreshments consisted of cheese, crackers, and cold cuts along with a vegetable and dip platter and the bar was open at the Club today as well. Our next stop took us to the HMCS Queen Charlotte on Water Street Parkway. I had heard that they served great seafood chowder at their Levée and, as those of you who are regular followers of my blog and twitter will know, this foodie has a thing for seafood chowder! This version was really good served with a choice of white or whole wheat roll. Their signature beverage was Moose Milk. 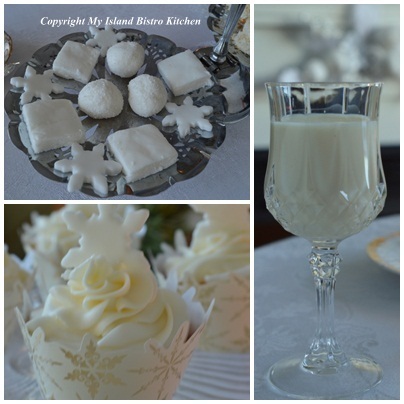 Yes, that’s right, Moose Milk – not quite sure on the exact ingredients but it is a concoction of rum or whiskey (not sure which), milk or eggnog, ice cream, and spices and ….. I didn’t get to try it because I was driving but I heard it was really good! 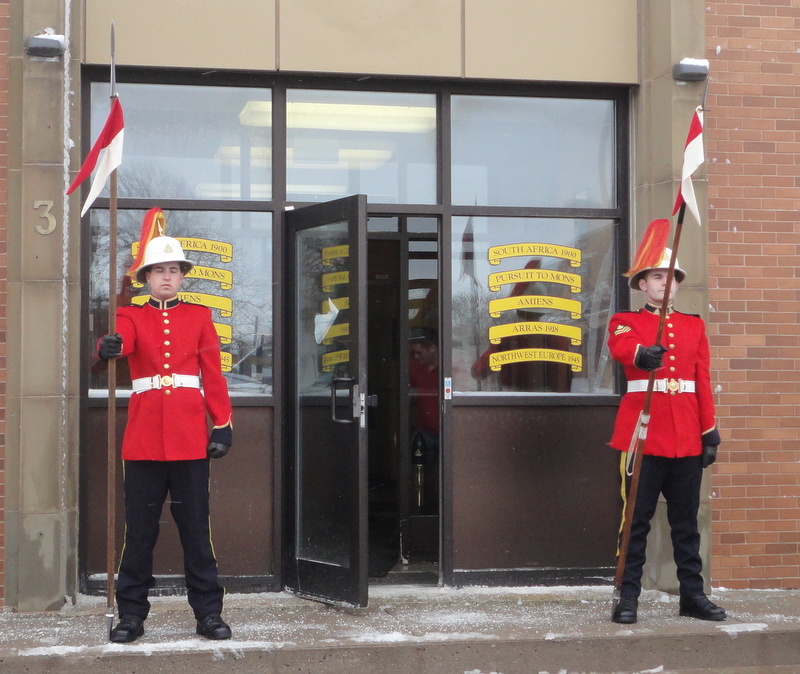 Next on the agenda was the Prince Edward Island Regiment on Haviland Street. These two lads stood at attention as levée-goers made their way inside and I’m sure these two fellas must have been frozen. 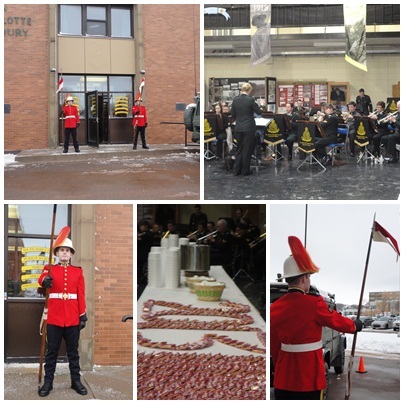 The PEI Regiment band was entertaining inside. 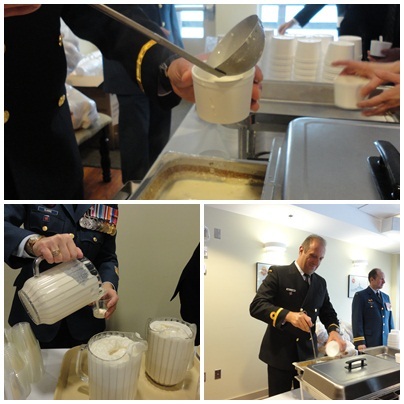 The Regiment served chowder as well and had the packages of crackers laid out in the shape of 2013. Having just had chowder up the street, I had to pass this one by but it sure looked good, too. 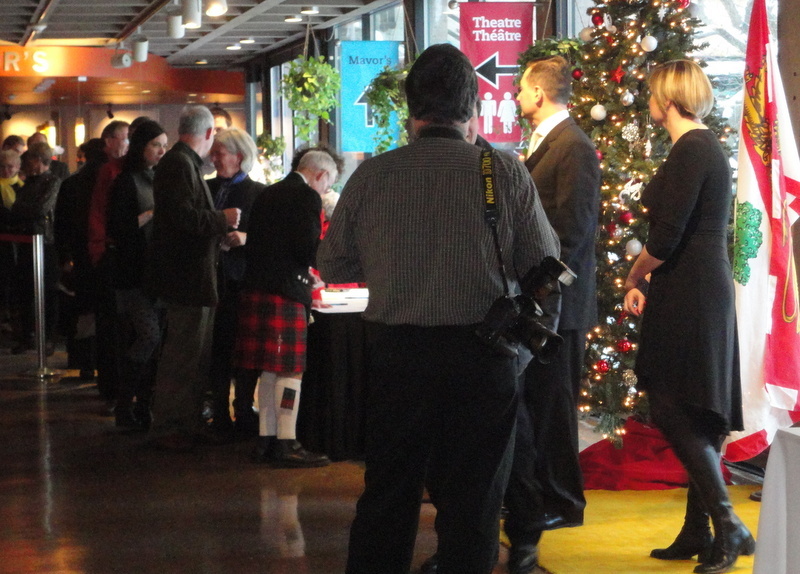 After a busy morning of five levées, we took a mini break and then attended Premier Robert Ghiz‘ levée held from 3:00pm – 5:00pm at the Confederation Centre of the Arts in the city center where the Premier and his wife, Kate, along with their two wee daughters greeted Islanders. There was a huge line-up for this levée but we arrived about 20 minutes before it began and were easily able to get inside the lobby from the cold while we waited. Each attendee was photographed with the Premier and his wife (last year, the photographs arrived in the mail 2-3 weeks into January). 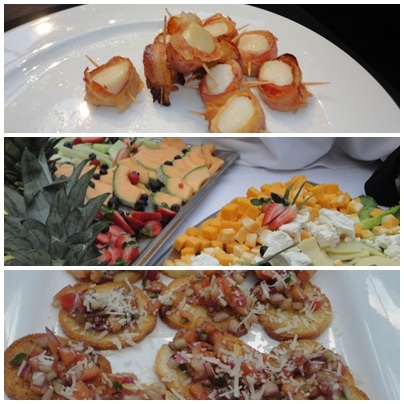 The reception was held inside Memorial Hall where there were trays of fruit, cheeses, and crudités and waiters circulated with trays of bacon-wrapped scallops. My favorite was the same as last year, a whipped garlic potato piped into small dishes and then topped with bacon bits, sundried tomatoes and chives, and/or sour cream. Simply divine! 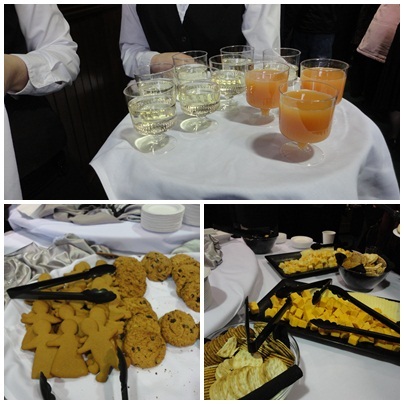 Fruit punch, wine, tea, and coffee were also available. 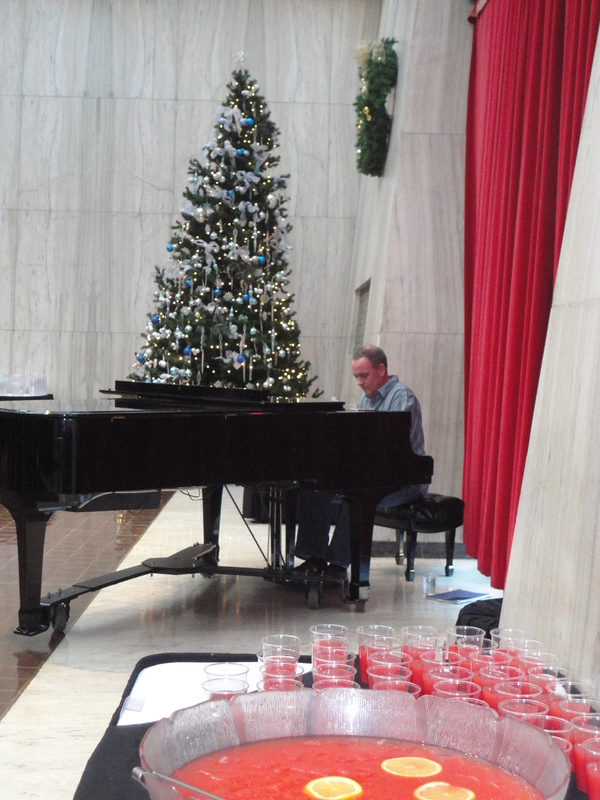 A pianist provided background music. I hope you have enjoyed this mini-tour of just a few of the New Year’s Day levées held on our beautiful Island on this cool winter day. Best wishes to you and yours for good health, happiness, and prosperity in 2013.